Life in the Lakes from White Moss House, once owned by Wordsworth. We always have the whole family here at Christmas. The house is perfect for this. Lots of bedrooms and bathrooms, a big kitchen, a dining room that seats lots of guests, and our lovely lounge with log fire and baby grand piano. I don't spend a fortune on buying new decorations each year, but I do have a few suggestions for decorations that look good and don't cost a packet. You'll find some good little home made Christmas tips here. You'll see tea lights feature a lot. I find the best value and best choice locally for me is at Homebase, Kendal. You can see what Homebase have to offer here. For a truly great and inspirational set of candle, lights and other Christmas decorations, look at old favourite John Lewis. As I love John Lewis but don't live anywhere near a store, I use the online order service a lot, and it's excellent. 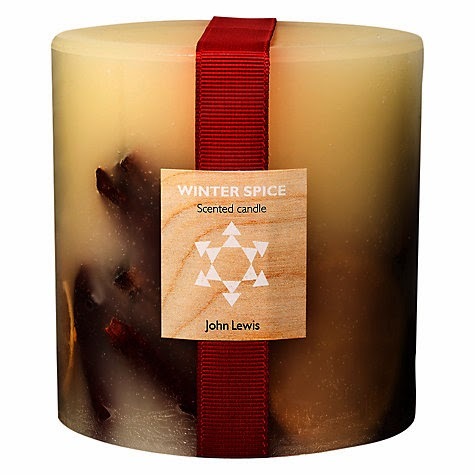 Here's a lovely candle from the John Lewis Christmas range. Damsons are one of my favourtie fruits. They grow well in the Lakes, and this year has been a bumper year, so I've made damson chutney. White Moss chutney ready for bottling. Beatrix Potter's Country Cooking by Sara Paston-Williams, published in 1991.You can still buy this book from amazon, either new or second hand. The recipes come from the Lake District, and are all really excellent. Damsons and other Lakes local ingredients are used. This could make a great gift for someone who loves the Lakes and loves to cook. I'll post a picture of the finished chutney later. If you don't want to miss it, follow me! 2014 has been the first year that we've lived at White Moss House without welcoming guests to stay and dine. We've sort of retired, and currently we're just living on our own here at White Moss House. Lucky us! Yesterday was a fabulous day, and we walked up Silver How- one of our favourite walks from the door. Today is looks as if we're moving into autumn. It's a little drizzly and grey. We're not complaining though. It's been great. If you want to walk from White Moss I've written a page about 6 circular walks from White Moss, taking in Grasmere and Rydal Water. You can read about White Moss walks here. 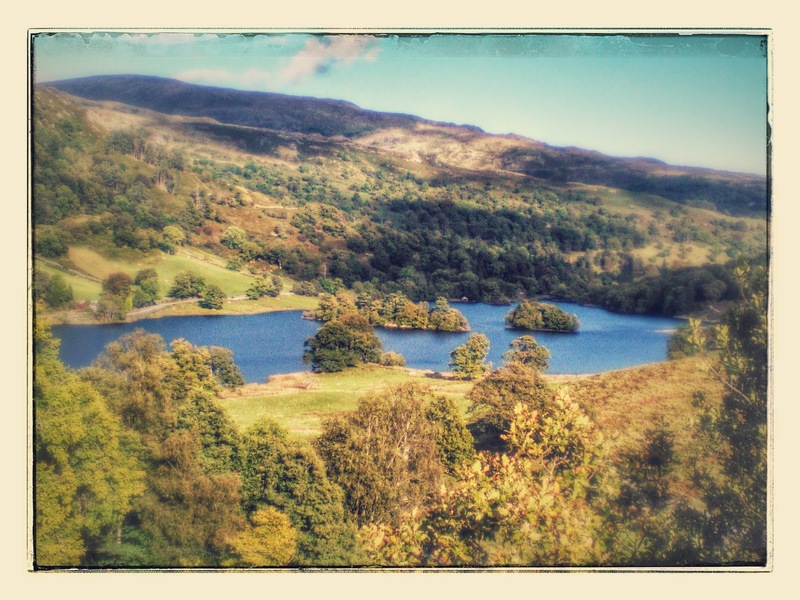 This is a photo I took last week from the end of Loughrigg Terrace. Rydal Water looks an incredible blue. I'll be dropping by this blog with snippets from my online writings, photos, and other points of interest ( well, that I think are of interest). Online writings? I've been writing for Squidoo for 5 years, but that has now gone, and we've been moved to Hub Pages which also seems to be struggling right now. However, I still keep writing. Today I've been updating my page about sorrel. Read all about sorrel here . A couple of weeks ago deer invaded the herb garden and ate the sorrel down to the stalks, but it's now got some nice fresh new leaves. The late summer sun has suited it. I especially like a Jamie Oliver recipe for sorrel risotto that you can find on this page . Not sure what sorrel is? Here's a picture. See, you do know what sorrel is. It's easy to grow and has lots of uses. Well, farewell fabulous summer. It was good to know you. Now that the days are shorter, cooler and wetter, I'll be tapping away at my blogs more. Every cloud has a silver lining. Why not follow me? The Keswick to Barrow Road race takes place today. From Keswick , along Thirlmere, over Dunmail Raise, through Grasmere, over Red Bank, to Coniston then home to Barrow.40 miles of walking and running. If you think that sounds fun, here's the link to the Keswick2Barrow website. Time to start planning for 2014? To the south of us today it's the Fairfield Horseshoe Fell Race . As I type this there are runners pushing themselves around the top of Fairfield. Here's the link to the Fairfield Horseshoe Fell Race. Me? I might go for an hour's walk along Loughrigg Terrace. It's a bit damp, but nothing to stop me walking. Here is the walk I'll be doing Walk number two on this page of White Moss Walks.. Did you know that Wordsworth walked miles and miles every day? If he had visitors he wanted to get rid of, he would take them on a long, hard, fast walk- the next day they would find a reason why they suddenly had to leave! Here's just one of the many photos I've taken from Loughrigg Terrace. This is Rydal Water, taken from the little rise at the south end of Loughrigg Terrace. Windows that lasted over 150 years. 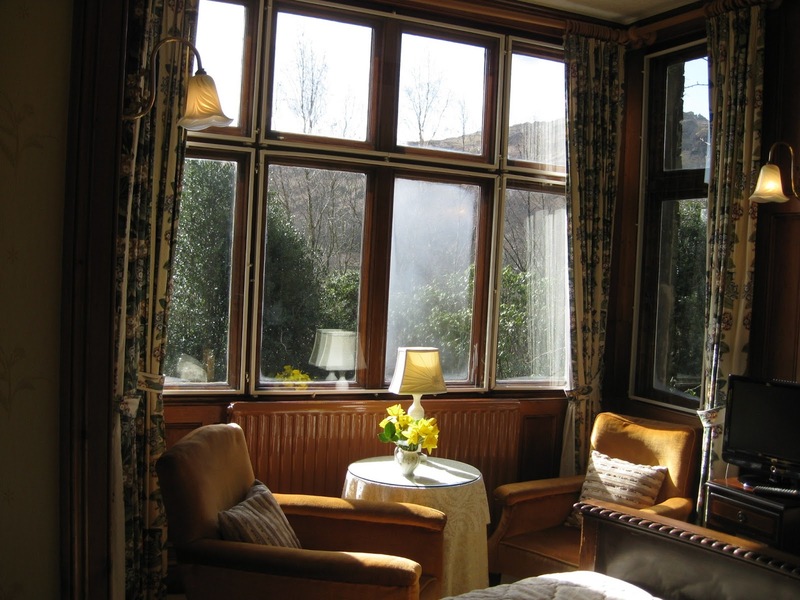 We have a lovely bay window in the Wordsworth lounge that was added over 150 years ago by the Wordsworth family themselves. We've finally had to replace some of it. You can see pictures and read about this in today's "Notes from a Lake District Garden" blog. The bay window goes all the way up the house, so that room 3 has the same bay window as the Wordsworth Lounge downstairs. Last year we decided to for new glazing to keep the room warmer and quieter. It has been a great success. From the window you can see Loughrigg Fell. To the left you can see Rydal Water- for now. Sadly, when the trees comes out fully our view is rather blocked. The walk up Loughrigg is one of many that we do from our front door.We went on about The White Moss Walks and how great they were years ago. Now the powers that be have decided they are so good they have put an official brown tourist information sign up. We are just so lucky to be able to pop out on one of these walks nearly every day. 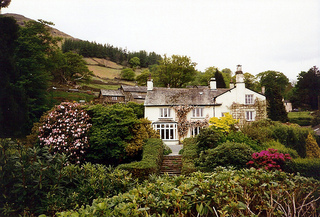 On Mayday 2013 Wordsworth moved to Rydal Mount, where he lived until he died, aged 80, in 1850. It's a lovely house, and Wordsworth was happy there. He'd lived at Dove Cottage , Grasmere ( where he wrote his most famous poetry), and also at other places in Grasmere, including Allan Bank and the Rectory, none of which he liked for various reasons. At last, in 2013 , rich and famous, he rented Rydal Mount, and for the next 30 years he played a big part in the life of Rydal Village. Wordsworth bought my house, White Moss House, for his son, Willie, around 1830. He was concerned that his son should settle down and raise a family......rather like us today! To find out more about William Wordsworth, Wordsworth Houses and Wordsworth's Lake District click this link. 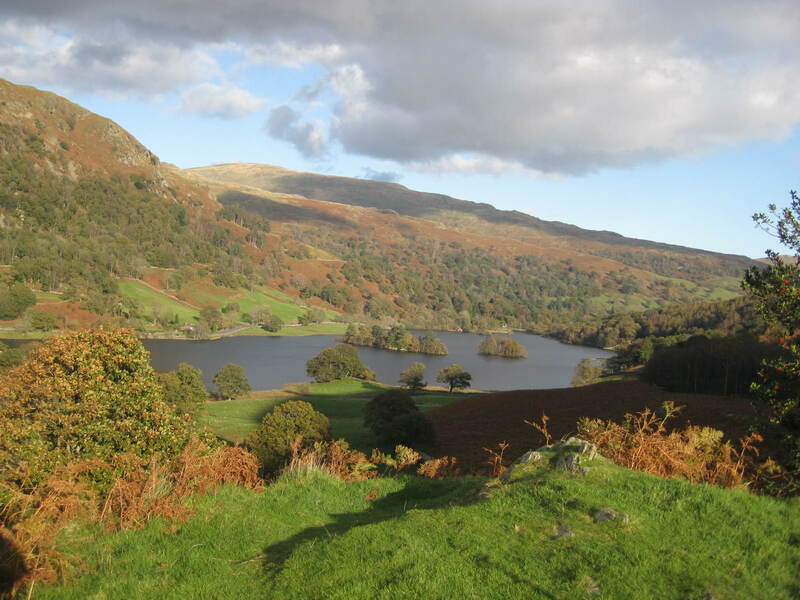 Photo of Rydal Mount thanks to David Willis and Cumbria Tourism, not for reuse without permission. I'd forgotten this blog- and how pretty it looked. I spent quite a long time setting up this blog with the pretty colours and background, then I forgot to write anything for over a year. This will be remedied.... I'll be posting here regularly about the Lake District, old houses, gardens, sheep, deer, daffodils , walks, maybe knitting... all sorts of possibilities. If you would like to follow this blog, pin pictures or leave messages that would be great. You can also see my other blogs - links are on below..
Last minute offer for October break in the Lake District. Don't miss a post- sign up now!